After falling in love with Terre dOc BB Cream, I became interested in almost every single one organic BB cream I could spot. BB creams are great for quick application and natural makeup look. 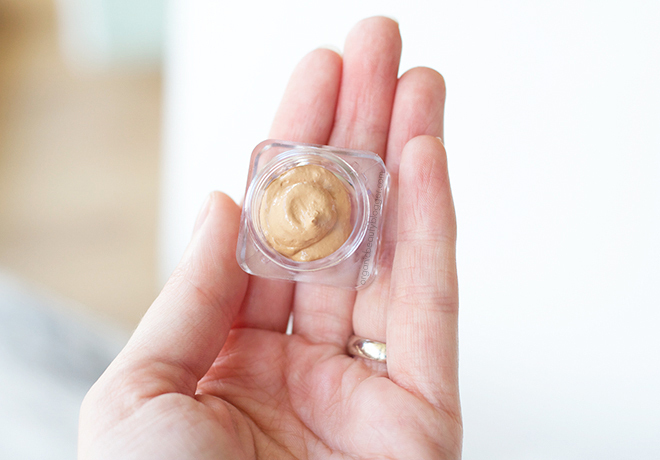 I bought this tiny sample at my local organic beauty store and hoped to like it. LaMav BB Cream caught my eye not only because it has lovely packaging and rejuvenating ingredients, like rosehip oil, but additionally contains titanium dioxide, which makes it a BB cream with SPF. I also noticed that it is almost unscented so you won’t have any problems disliking the product because of its intense smell. Now, LaMav BB Cream gives out two promises: it’s made with organic ingredients, and it’s mattifying. My skin’s dry and mattifying usually equals drying and cakey for me. However, it’s not the case with this BB cream. The application is smooth, it feels almost butter-like, and I didn’t even need to apply my day cream prior the application. My face looks matte, but at the same time fresh and awake. It gives a nice light coverage and stays well for the entire day. My friend who has combination skin also tried this BB Cream and said she needed to use a compact powder to reduce the shine after a few hours. If your skin is towards oily, keep this in mind. *Aloe Barbadensis (Aloe Vera) Leaf Juice, Titanium Dioxide, *Prunus Amygdalus Dulcis (Sweet Almond) Oil, *Simmondsia Chinensis (Jojoba) Seed Oil, *Persea Gratissima (Avocado) Oil, *Glycerin, Cetearyl Alcohol, Glyceryl Stearate Citrate, Cetearyl Olivate, Sorbitan Olivate, Iron Oxides (CI77492), Tocopherol, Cetearyl Glucoside, Glyceryl Caprylate, Iron Oxides (CI77491), Mica, Iron Oxides (CI77499), Sodium Anisate, *Vanilla Planifolia Fruit Extract, Glycine Soja (Soybean) Oil, *Rosa Eglentaria (Rosehip) Seed Oil, Sodium Hyaluronate, Hippophae Rhamnoides Seed Oil, Alcohol, Ubiquinone, Ascorbic Acid, Aqua, Cucumis Sativus [Cucumber] Fruit Extract, Malpighia Glabra [Acerola] Fruit Extract, Tin Oxide, Terminalia Ferdinandiana (Kakadu Plum) Fruit Extract, Glycyrrhiza Glabra (Licorice) Root Extract, *Rosmarinus Officinalis (Rosemary) Leaf Extract. * designates Australian certified organic ingredients. I would call it my new favorite, but the color is just too dark for my fair/light skin, and this is the only shade in the range. I’ve tried to apply it in different ways (with a damp sponge, with a kabuki brush, with my bare fingers), hoping it would adapt, but still, it was just too dark. I’d say it’s more suitable for medium skin with yellow undertones. 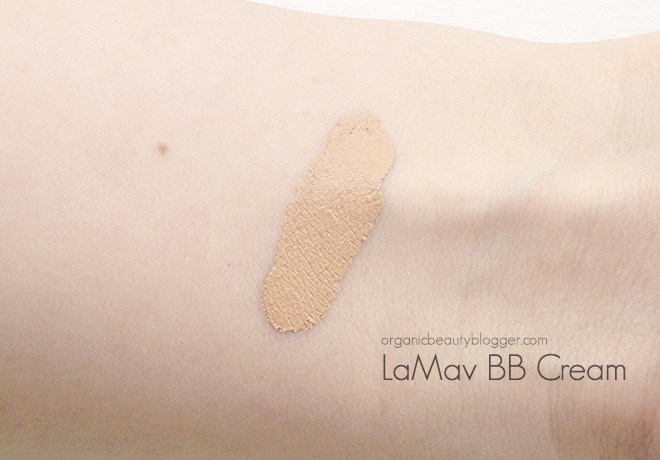 LaMav Certified Organic BB Cream (50 ml) is available for approx. $40/£24. 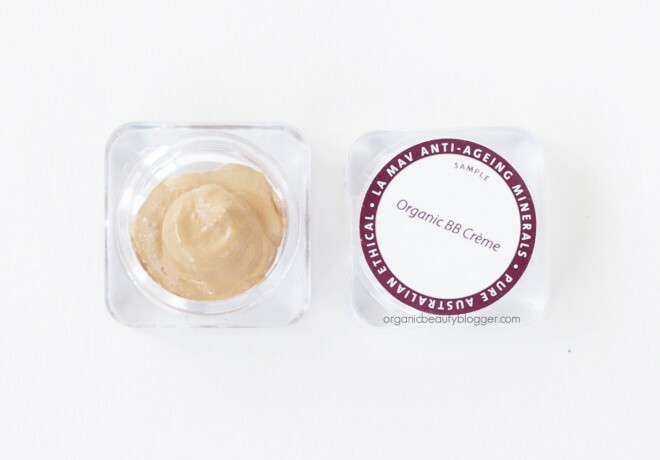 Have you tried this organic BB Cream? This sounds lovely…shame about the shade. I tried one from Yes To which was too dark for me too…they need to make ones for our pale skin haha! They really do! Terre dOc BB cream is a perfect match for me, but even that it’s hard to find, I hope it won’t be discontinued! I’ve been looking for a lighter product like this for summer and the color looks like it may work for me.